Some foods just go together — peanut butter and jelly, wine and chocolate, cheese and well, everything. And, of course, everyone's favorite classic flavor combo: chocolate and peanut butter. 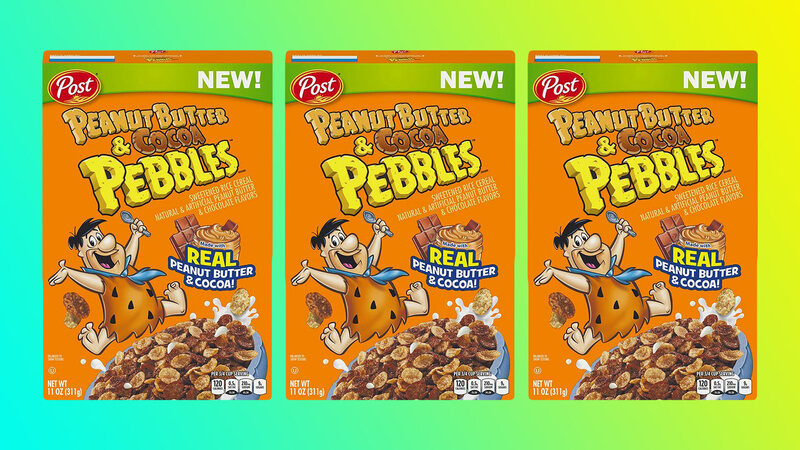 Often paired in desserts, this chocolate and PB pair is joining together for breakfast via Post’s new Peanut Butter & Cocoa Pebbles, and to be honest, this may be our taste buds’ version of a royal wedding. Yabba dabba dammmn, son! Is Post killing it lately or what? Joining Golden Oreo O’s and the Nilla Wafer Banana Pudding cereals on shelves now is new Peanut Butter & Cocoa Pebbles. I doubt any Chob PB cereal will ever dethrone Reese’s Puffs in the mind of the general populace, but I will always be down to let them keep trying. Walmart. Now, you may be saying, "Wait; we know about this already. Don’t we already have Reese’s Puffs?" Yes, we do. But it’s important for all relationships to keep things fresh, and sometimes that means seeing other chocolate-peanut butter breakfast cereals. And really, can there ever be too much perfection? We don't think so. This is a world that deserves a lot more joy. It's also worth pointing out that while Puffs are round, Pebbles are flat, and we all know the texture makes a huge difference in taste. Peanut Butter & Cocoa Pebbles are a sweetened rice cereal that is made with real peanut butter and cocoa cereal pieces, and while we haven’t been lucky enough to taste it yet, we imagine it is dessert-for-breakfast perfection. As for where to find this new flavor, it’s not everywhere yet, but it has already been spotted at Walmart and can also be bought on Amazon (in a giant 12-pack! )… but maybe you should buy one box first and taste it before going for that level of commitment. Let’s be honest: Life is hard. Don’t we deserve to start our days with a special treat sometimes? We think so.